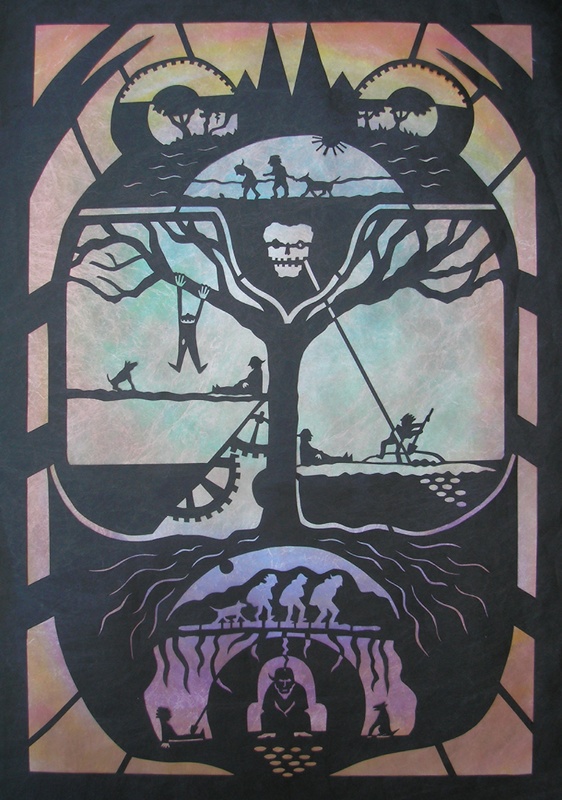 Here’s the first in a new series of paper cuts inspired by the fiction of Edgar Allan Poe : “The Gold Bug” narrates in black tyvek, acrylic ink, and metallic spray paint, the story of a beach-combing member of the faded Southern aristocracy who hunts for a buried treasure along with a freed family slave who takes most of the risks and does most of the work but reaps none of the profit. For this series, I decided not to work with the horror stories but the ones that are merely odd. Some of them address antebellum culture (race relations, urban crowding), some reflect Poe’s intellectual interests (cryptography, scientific experimentation), and most of them make some reference to death and decay. My current process of making paper cuts requires very precise work. This may change when I get more proficient. Right now, for each image, I make a loose sketch and a thumb nail sketch, followed by a master drawing, and a guide for cutting the master drawing. Then I trace the cutting guide onto a piece of white tyvek. I cut this white piece over a black piece of tyvek, making two versions at the same time. One version will be black over white paper or dyed tyvek. The other will be painted or dyed tyvek over black paper. The two can look surprisingly different. Here is the other version of “The Gold Bug,” metallic sprayed tyvek backed with black paper. I plan on a series of 12 paper cuts: two versions of six images, one image for each of the six stories. 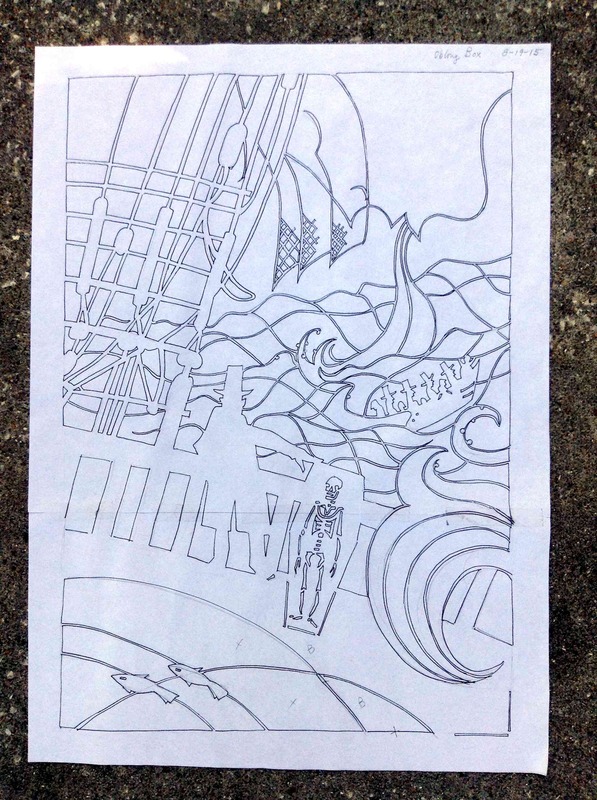 Each image has a major motif (a beetle, a tree, a ship) with added elements of visual narration intended to highlight some of the action in the story. 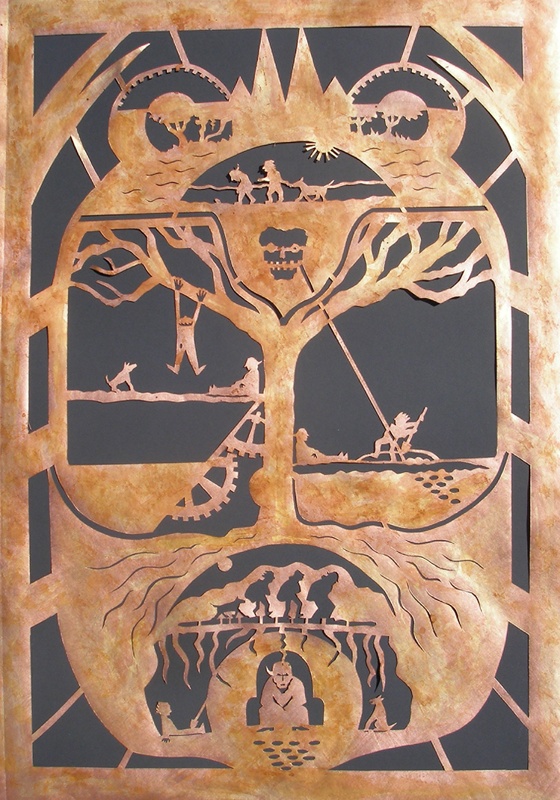 Also, there’s a skeleton, or at least a skull, in each paper cut. Above are two examples of cutting guides for the images I’m still working on. The cutting guides are still rough; final changes happen when I trace on tyvek and again as I actually cut and begin to see how the positive and negative shapes and spaces balance out. This series will be called “The Dark Edge.” In addition to the work related to Edgar Allan Poe’s fiction, I have in mind a few paper cuts inspired by the narrative relief prints in Lynd Ward’s enigmatic novel in pictures, Mad Man’s Drum. In the novel, after a slaver steals an African healer’s drum, things go very badly wrong for him, especially for all the women in his life. This irked me. 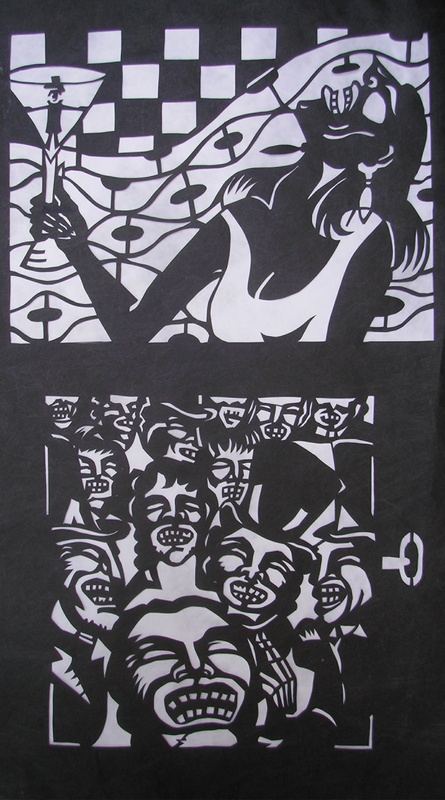 In “Laugh,” I pair my paper-cut image based on one of Ward’s prints (lower) with an image of my own design (upper) that revises his narrative to turn the tables and give a female character the upper hand. Ward’s book and my revisions are a little Poe-like, so I think these paper cuts will fit together nicely. 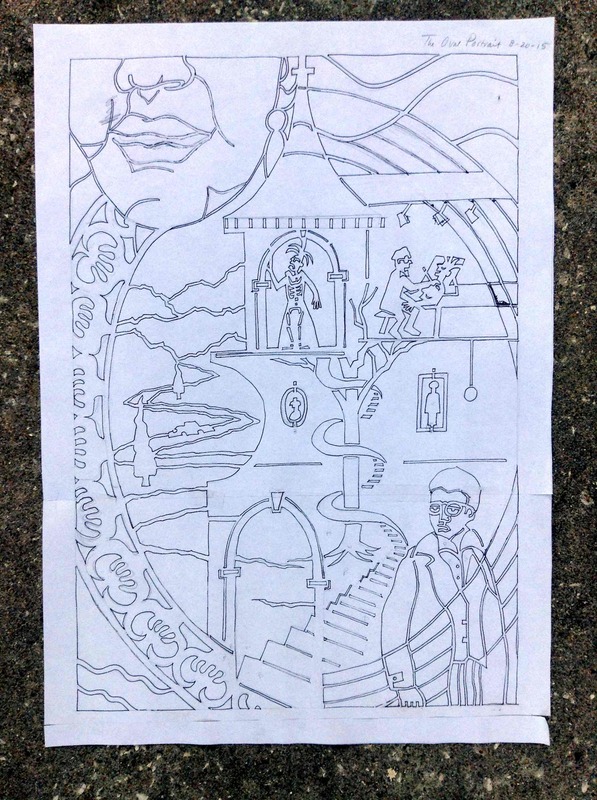 This entry was posted in Current work, Mountain South, The Other South and tagged Edgar Allan Poe, Lynd Ward, narrative art, paper cuts. Bookmark the permalink. There’s a local artist here who does a lot of cut work, different themes, but really intricate as well. I love it!